There are a number of ways that an individual can get involved. Not everyone can make a financial contribution, but everyone can contribute in some way. If you believe in the saying ‘Think globally. Act locally’ and are passionate about making a difference, then convert your precious time into endangered species conservation work and improve your local environment by becoming a volunteer with the Friends of the Helmeted Honeyeater. Get connected! Learn skills, gain experiences, share knowledge. Whether you are looking to do your bit for the environment, want work experience in the industry or want to volunteer with a great group of friendly people we have a role for you. No experience is necessary for most roles. Details of our current opportunities are listed below. The best way to get started is by dropping into the nursery and saying hello. Check out our opening times here. If you are studying natural resources, horticulture, teaching or undertaking some other form of education or training, community based work experience will be held in very high regard by employers. You can be involved in a number of ways. For further information about any of our volunteer opportunities please contact us. Learn new skills in plant propagation and plant identification or share your knowledge. Come and enjoy the colour, movement and sound of the bush whilst enjoying the company of fellow Friends as you pot up plants and get involved in various aspects of nursery management. Check out our opening times here. All activities are undertaken under the supervision and direction of our Nursery Manager. and bring a picnic lunch to have in the bushland surrounds afterwards. Morning tea and training is provided. Activities may include tree planting, seed collecting or works around the nursery or at differing locations around the Yellingbo Nature Conservation Reserve and area. Meet at the Yellingbo Ranger’s House, 1217 Macclesfield Road, Yellingbo (Melway Map 305 Ref. G11) at 10am. BYO lunch. Most equipment is supplied. Please dress for the weather. Sturdy boots are required, gumboots in wet weather. 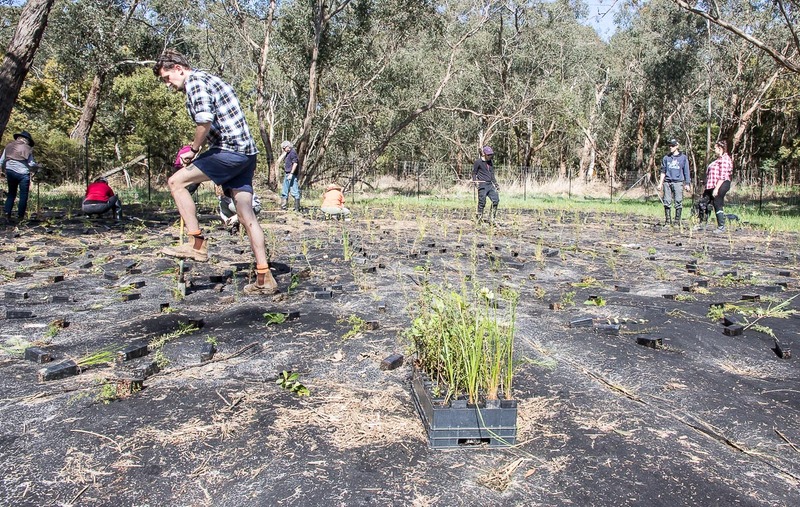 All activities are undertaken under the supervision and direction of our Revegetation group Coordinator. 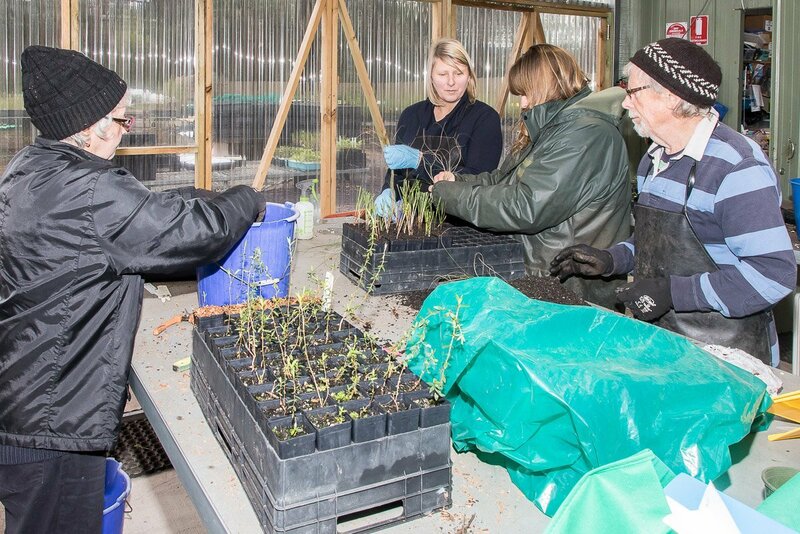 All plants grown and sold by the Friends of the Helmeted Honeyeater community nursery are of local provenance. All propagation material is collected under permit to protect and preserve the integrity of our natural environment. All activities are undertaken under the supervision and direction of our Nursery Manager and Revegetation group coordinator..
Start / finish date: Ongoing. A minimum commitment of once per month, for 12 months is required. Use your bird observation and bush skills (or learn) in a hands-on field based volunteer role supporting key management objectives for the critically endangered Helmeted Honeyeater. Join a team of like-minded people working to halt, and reverse, the threat of extinction for this bird. This is a morning role only. Volunteers start around 8.30-9am and provide half the daily nectar requirement of the breeding populations of Helmeted Honeyeaters. To survive, the birds need to forage for the bulk of their daily food needs. Whilst in the field we monitor the health of the birds and report any concerns for follow up management. We provide induction when you start, which involves a large proportion of in-the-field training. You will then be placed into the roster with an existing volunteer according to your availability and our roster needs. You will get wet and/or cold or hot at times, but you will expect this in a year round role where you’re out in the bush. It’s part of the joy! 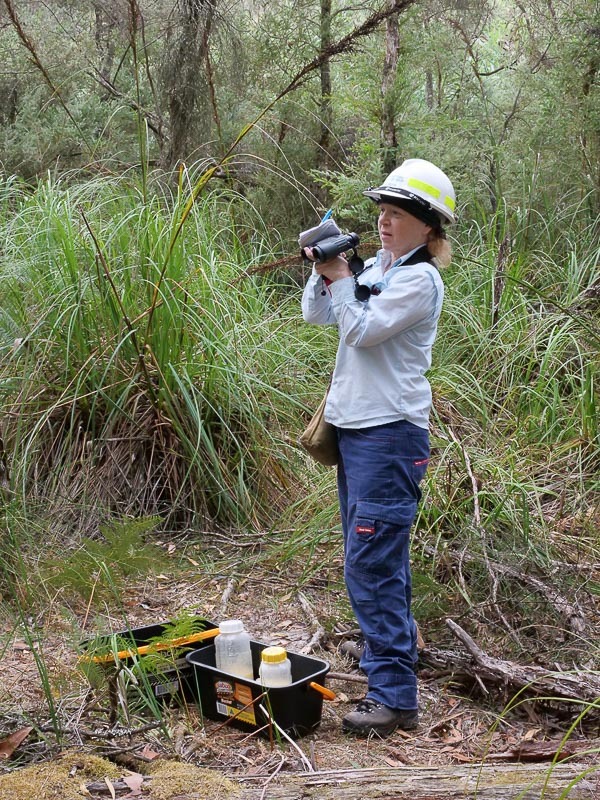 The program operates under the direction of the Helmeted Honeyeater Recovery Team. This Team makes management decisions about the bird and its habitat. Volunteer Field Assistants come under the auspices of the Dept of Environment, Land, Water and Planning (DELWP), with DELWPs Senior Scientist Ornithology leading the field based team. A Coordinator of Volunteers is employed by the Friends of the Helmeted Honeyeater, funded by DELWP. 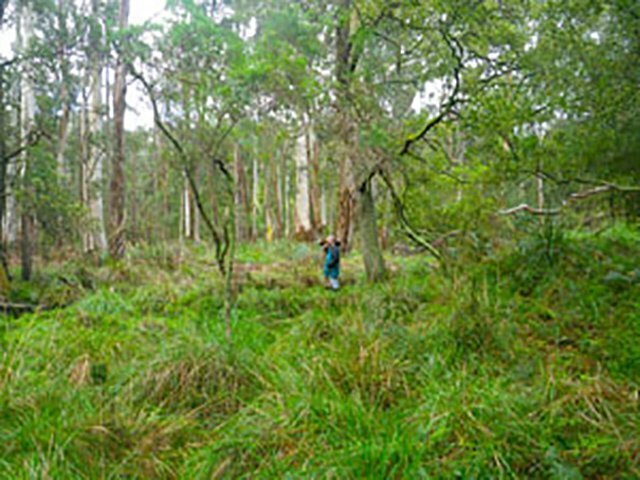 We also work closely with Parks Victoria, as the manager of the reserve in which we operate. It sounds complex, but the strength of the partnerships make it work! Use your presentation skills to assist school students and/or adult groups learn about the Helmeted Honeyeater, its habitat and the threats to them. Share your love of the environment with others. Reasonable PC and IT skills required for using a prepared Powerpoint presentation. Working with Children’s Check (volunteer) required. Events may include classroom & community group talks and/or informal community markets & fetes. Training is provided by our Environmental Coordinator. Join our school group visits to Yellingbo Nature Conservation Reserve. A core part of our education program with schools is to plant future habitat for the Helmeted Honeyeater and the other species that co-exist with it. The day may also include a guided habitat walk, a tour or hands-on experience in our nursery or environmental games. All activities are undertaken under the supervision and direction of our Environmental Coordinator. Working with Children’s Check (volunteer) required. Are you looking for a volunteer activity that focuses on the outdoors and held during the working week? Our community group needs and welcomes assistance. Help us to plant or grow future habitat for the Helmeted Honeyeater and the other species that co-exist with it within Yellingbo Nature Conservation Reserve. Your corporate group can make a substantial difference in just one day whilst having a great day out. All equipment is supplied. All activities are undertaken under the supervision and direction of our Environmental Coordinator or Nursery Manager. Successful groups don’t function without the dedication of a committee. New members are always welcome. Click here for information about the current committee. One of our members provides fantastic photographic images for our presentations, merchandise and newsletter. Another member is a botanical artist and contributes her drawings for reproduction in our merchandise range. One member has particular skills in finance and committees. Another is really good at producing our newsletter. These examples represent only four of our members. Everyone has something unique to contribute to the group. Let us know how you can contribute. Do you enjoy working on and implementing projects that engage others? Do you understand marketing and promotion? Can you help us unravel the secrets?